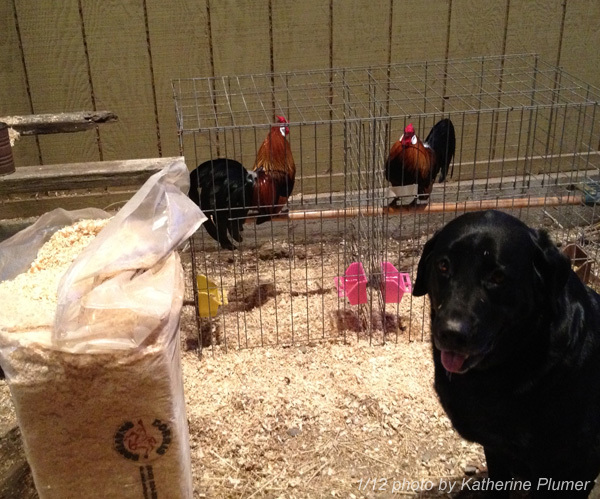 So, changing gears from the big engraving show last weekend, I have a big poultry show this weekend. A lot of my engraver buddies were unaware of this "chicken thing" in my life, but I think they kinda got the point after thumbing through the 100ish pieces of chicken art in the portfolio... ;-) I answered a lot of chicken questions. All good, I'm used to it... 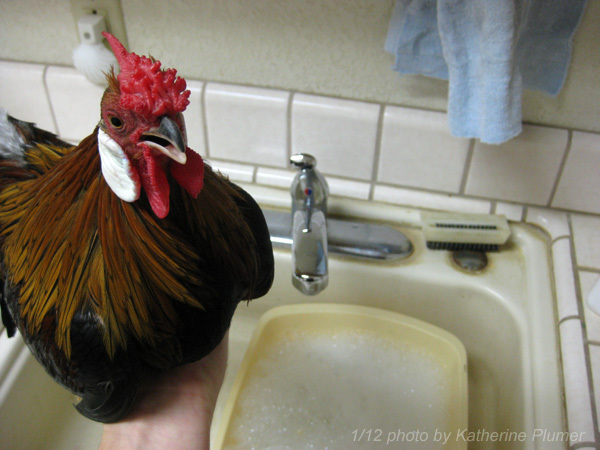 There is always a bit of disbelief regarding the notion of washing chickens. Yup, I really do wash them in preparation for a show. Sometimes they just need a little, sometimes they need a lot. But even more importantly I think is the fact that washing and grooming a bird seems to do wonders for taming it. 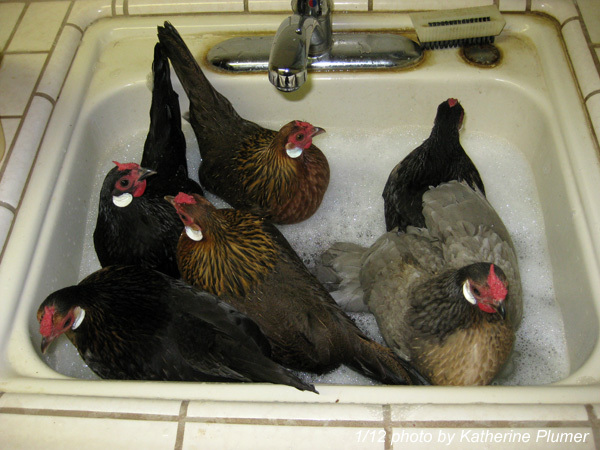 Today I washed 13 birds. Here's my first victim, I mean volunteer. If pictures could talk, he's quite vocally expressing his displeasure. This guy has never been shown, and has not been handled much. They do eventually settle in and seem to like it, but I'll admit it can be chaotic at times. I didn't manage to photograph those moments, I had my hands full! Scrub a dub dub! I use dog shampoo. Some people use a mild dish soap. Girls are a little easier to deal with, they're more civilized toward each other so I can put a bunch in the sink at once! 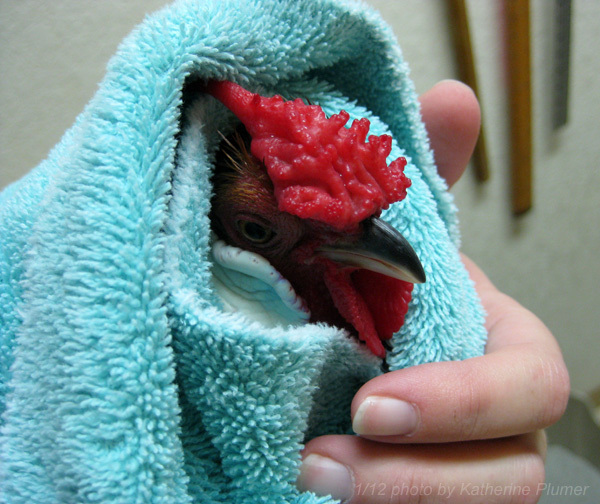 All clean and wrapped up! 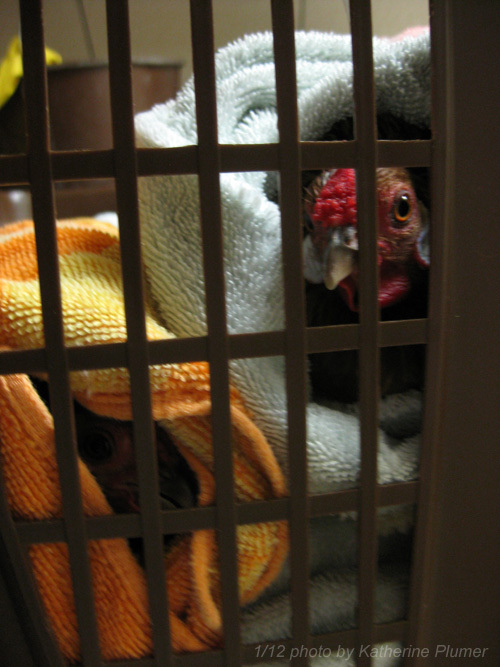 After they've been in the towels for a while, it's time to trim beaks... Oh, I have to share with you something totally cool I learned last weekend from a friend. I seriously thought he was pulling my leg. 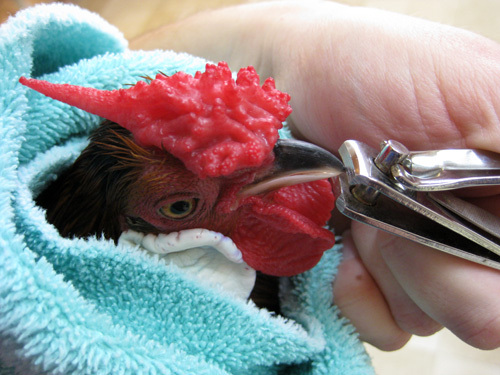 Sodium Hyaluronate, derived from chicken combs, is some sort of magical goo that's used in some types of eye surgery. I don't know enough about it to explain it, but I had no idea. Now I want to know where the chicken combs come from... 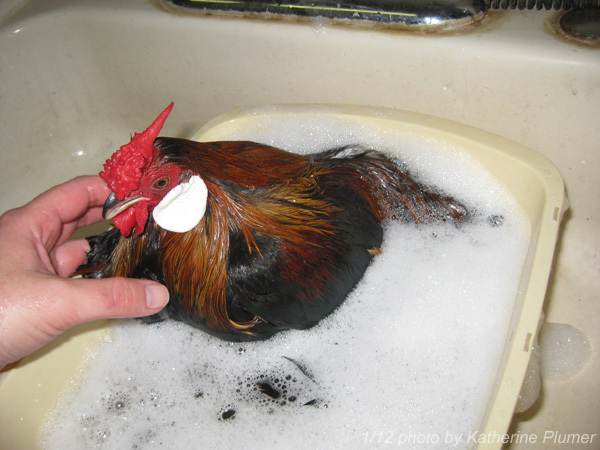 I've never heard of the combs being specifically harvested in any sort of poultry industry. Anyway, little tangent there for you to ponder. 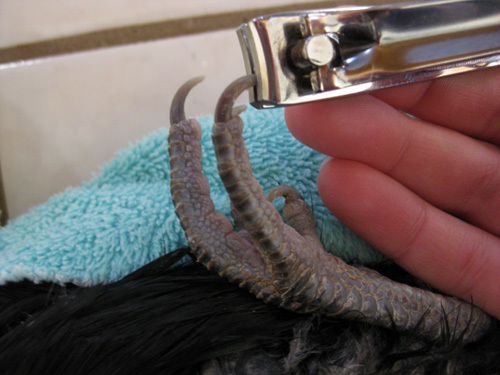 Trim the toenails (this can be a little scary if you've never done it before). And everyone gets a numbered leg band for show. 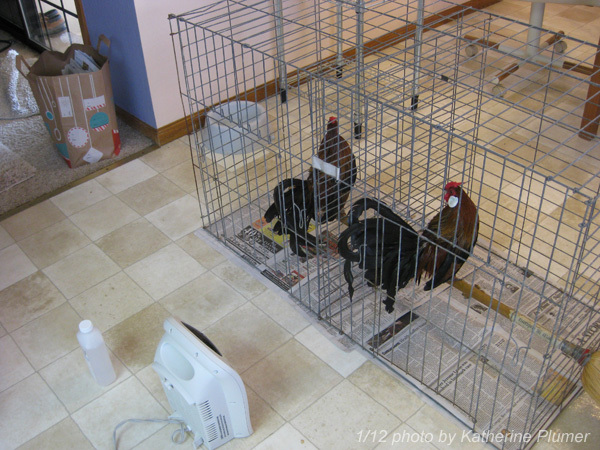 Normally this time of year it's cold and rainy, and I end up drying birds in the kitchen, where I put them in cages and crank up the space heater. But it warmed up enough today that I could let them dry out in the sunshine, which is so much better! Look at those guys! Holy tail feathers, Batman! Everyone's tucked in for the night. 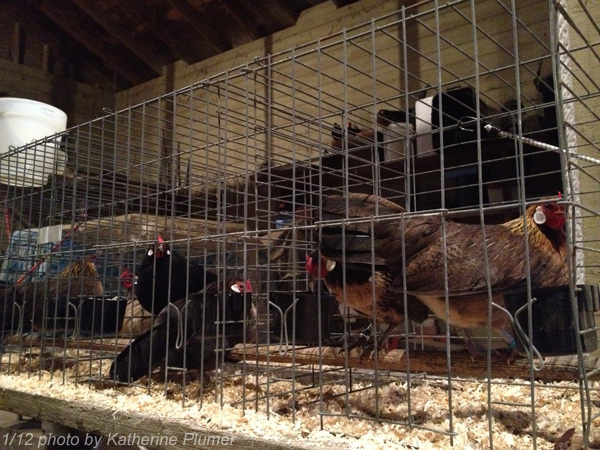 They normally live in big coops, but are spending a couple days in "show cages." 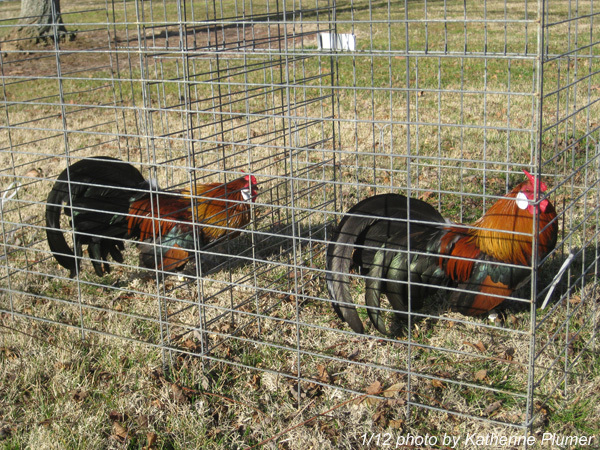 These are the types of cages where they are housed during a show, and they settle in much nicer at the show if they have spent some time in these cages beforehand. There you have it! 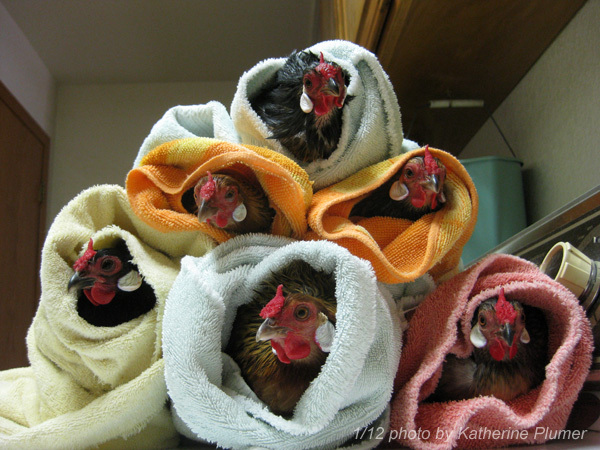 A day at the chicken spa. Now come on down to the fairgrounds in Stockton on Saturday and say hi! Now that's the funniest thing I've ever seen, especially the pile wrapped in towels! 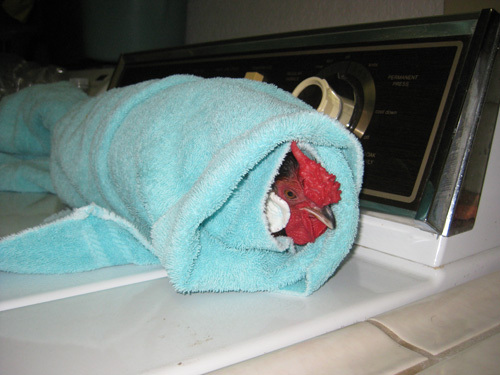 I still love the chicken burritos! - BMc. 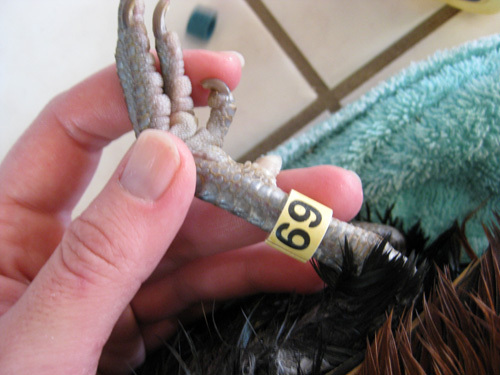 Impressive comb on that BBR male to go with those fine tail feathers. I wish I could be there to see them in person. I am anxious to see the "other side" of the knife! Saw Red Tails...I hope its the P-51 "Cadillac of the Sky"
Beautiful pictures! 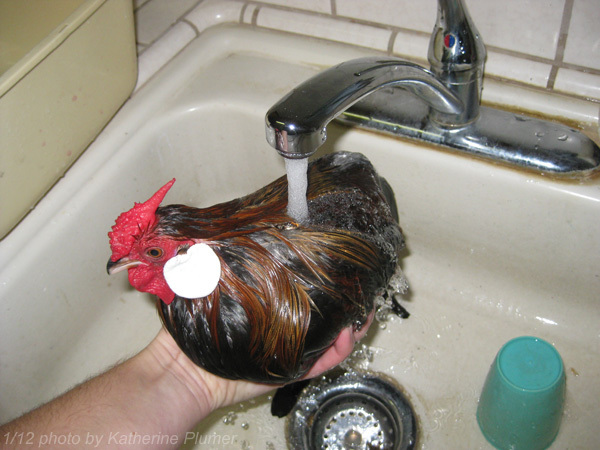 I've trained chickens before but never had to wash them! They are lucky to have such a nice spa. All the best at the show. I love all your posts but this has to be the best ever! Much easier to wash ducks - you just put them in the tub with a bunch of warm water and some baby shampoo, close the curtain and they wash themselves (and make a giant mess out of the tub in the process...). I love your step-by-step photos! 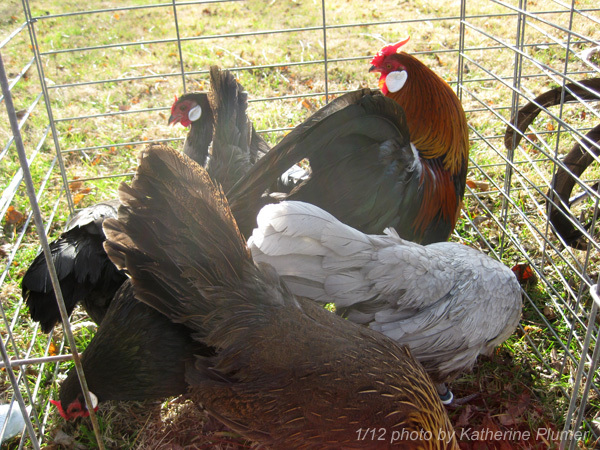 We've shown chickens for many years, and linked to this post on our new blog, askapoultryfarmer.blogspot.com.